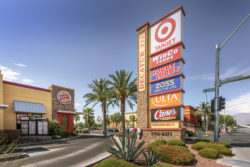 LAS VEGAS, NV (November 29, 2018) –Brixton Capital has purchased a grocery-anchored, 126,678-square-foot shopping center called Decatur 215, located at southeast corner North Decatur Boulevard and West Tropical Parkway in Las Vegas, Nevada, from Houston, Texas-based Weingarten Realty (NSYE: WRI) for an undisclosed price. Decatur 215 was completed 2016 and is 100 percent leased to a mix of national and regional tenants, including: Target (NYSE: TGT), WinCo Foods, Hobby Lobby, Ross (NASDAQ: ROST), ULTA Beauty (NYSE: ULTA), Raising Cane’s, Burger King (NYSE: QSR), El Pollo Loco (NASDAQ: LOCO), Blaze Pizza, Fire House Subs and Chipotle (NYSE: CMG). Decatur 215 marks Brixton’s sixth acquisition of 2018. Ramez Barsoum and Aaron Bettencourt at Reza Investment Group represented the seller, while Brixton Capital represented itself. Brixton Capital is a preeminent private real estate investment firm that seeks to generate outstanding, risk-adjusted returns by unlocking embedded value in commercial real estate transactions spanning all property types. Headquartered in Solana Beach, California, Brixton is led by a team of seasoned real commercial real estate experts with an average of more than 25 years of experience. Brixton currently owns and operates a portfolio valued in excess of $1 billion, representing over 10 million square feet of retail, multi-family, office, industrial and land investments across the United States and Europe. For more information, please email Bob Emri, Chief Investment Officer, at bemri@brixtoncapital.com or call at (858) 683-7100 . Editor’s note: photo credit to Brixton Capital. Photo caption: Brixton Capital picks up Decatur 215, a 126,678-square-foot Las Vegas shopping center.